We have a culprit, who apart the monstrous deeds he has done, is emerging as a wretch, with no ability to think a single original thought, that dreams away in nightmarish fantasies. The terrorist has declared that his killings should serve to promote his big project, a ragged cut and paste job concocted from thoughts he has not produced himself. His ideas of national rebirth are taken from the classic fascist ideas box. 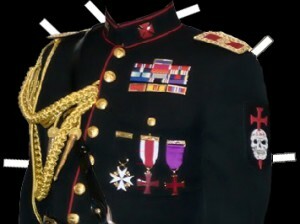 The rest, including the commander’s degree, is also borrowed plumes that the inflated peacock in his fantasy uniforms prances around in. In the real world a commander is a person who has charge of a military vessel, of other military personnel or alternatively a degree in some kind of honorary order. Some vessels, perhaps more than a rubber dinghy, the mass murderer never had command over, and his “Knights” were just lies and deception, perhaps inspired by some crackpot British right-wing extremists who played with Templar symbols. Those of us who have read books by the top-selling Swedish author Jan Guillou about Commander Hamilton, then his series about the Templar knight Arn, recognise the similarity: a one-dimensional «hero» that kills by the dozen, always because it is necessary, “for king or country”. Like the self appointed Commander from Utøya , Commander Hamilton gets a range of fantastic, gaudy medals and gongs, while the bodies are strewn all over in the wake of the killing machine’s raids. The reading of the terrorist’s so-called manifesto gives us insight into a little person who is consumed by his own ambitions and by the lack of his own ideas. He does what he does best: he lifts from others what he cannot write himself. This is actually the only thing the Oslo terrorist has done with some success, namely to forge success. He has allegedly made millions by selling fake certificates that help others to the progress they have not been able to create through good advice, coaching or their own efforts, but through simple fakes, easily bought solutions where one can bluff one’s way through the world. In his childhood bedroom, the lonely terrorist sat forging his own success. He drew symbols, and finds gold and glitter that he could use to create his glittering orders. That these orders and medals in the real world stood for something completely different and represent real deeds, completely escaped him. He cut and pasted, borrowing from others and built a facade big enough for the enormous self-image he was unable to fill. He went to photographers and portraits were taken. He dispensed advice to his fans that they should go to a stylist; maybe, even, use a little makeup before they have taken pictures of themselves. All this to build an image that he intellectually could not live up to. World history has been full of little people with big egos, people who have sometimes had power, and whose actions have had disastrous consequences. Historical circumstances have meant that some of them – whether a Hitler or a Stalin – have had great movements behind them. Our domestic terrorist had no movement; he had to fabricate it, along with grade systems, rank and stolen thoughts. He was not able to carry out the Holocaust, the Moscow Trials, or the Great Leap. All he did was to swagger around in his fantasy braided costume and kill children who begged for their life. That’s what he should be remembered as, a primitive child killer and not a political leader or thinker. The void in the terrorist’s own ability to create political ideology shows us the danger in the hatred that is spread by the extreme right- wing. The terrorist borrowed their thoughts, and few of them can be morally or legally for his actions but none of them called for open violence and armament, with the exception of the cowardly blogger Jensen, who from his desk, hiding behind his “Fjordman” alias, called for the arming of Western people and the eradication of those responsible for multi-culturalism. What they can be blamed for, however, are the embers of evil and hatred they blow on, for filling empty souls who find meaning in the fear and the struggle against «the others» and antiquated ideas of national re-birth that they obsessively promote. The trial, which is now starting, is a lawful assize against the mass murderer of Oslo and Utøya. But in our minds it should be more than that: a tribunal to condemn the criminal thoughts that turned an insignificant young man into a mass killer.